Ayurveda is the also known as the purest form of science on earth. Advanced as a result of quite a few hundreds of years, this natural scientific discipline has a basic of few fundamental elements – Air, Earth, Water, Fire and Space. Accomplished for more than 5000 years, this ancient science has its root in our own vibrant nation, India. It is a kind of science which works on a process which is slow & steady. Only long term treatments would attain the results. Basic theories behind the origin of Ayurveda shows the human being and universe are mutually connected and any sort of disease would arise only if there is a change in the balance between this two goes out of order. The slow & steady process of Ayurveda will not only cure the disease, but it’s more about correcting the base of human body. This will make sure a positive result for a longer duration and purifies the body from head to bottom. Kerala, so called the “God’s Own Country” is one of the most vibrant states of south India with nature at its best. Only place where beaches, backwaters & lush green surrounding make it a right spot to experience Ayurveda, the natural science. 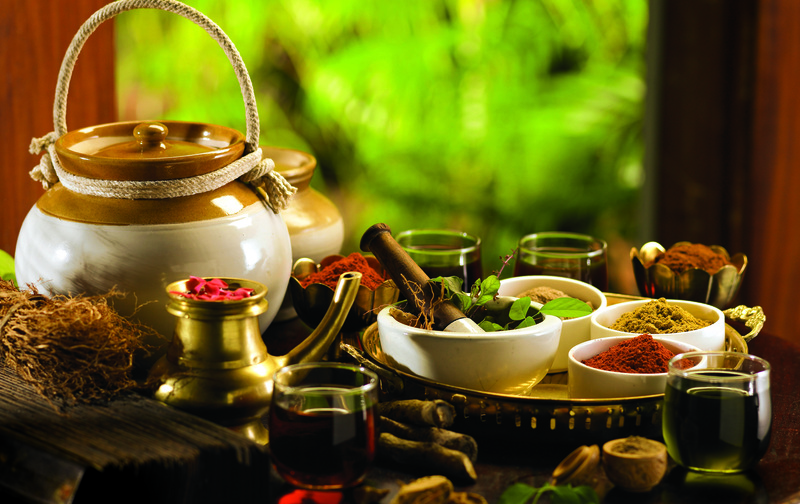 Kerala has many places to experience Ayurveda in its pure form. Herbs, Medicinal Leaves, Aroma oils and other natural products are available in plenty across Kerala. Since the state is so scenic with many natural beauties including many scenic spots & pleasant weather, Kerala is the ideal place for Ayurveda in a suitable and fresh environment. The state of kerala is known as the place of origin of Ayurveda. After several years, now the state received much recognition from across the world. “Magical Touch” & “Classical methods of treatment” are the two requirements to improve the inner body through Ayurveda. Kerala has the maximum number of Ayurveda-therapists since many generations and that’s because one could find them in any of the Ayurveda centres across country. Ayurveda stands as practice of longevity. As part of this, Ayurveda science works in 2 parts – tonification and reduction. Therapy of tonification covers up insufficiencies where as reduction therapies reduce the excess from the body. Ayurveda is everything about correcting the base of the body to bring it in to the harmony with Universe. Ayurveda & Kerala being the native state is a most sought tourist destination for those who want to experience the energy of Ayurveda. It’s really a stress buster, away from the hustle and bustle of the routine life; it soothes your body, soul and mind. A short session Ayurveda treatment opens up the pores of the body, which results in active freshness and a healthy life & gets you the fullest potential in your day to day activities. Having a general body massage during your Kerala Tour, preferably on the last day would soothe your body well. Present day houseboats are huge, slow moving exotic barges used for leisure trips, and are in fact reworked version of kettuvallams of olden times. The original kettuvallams were used to carry tons of rice and spices. A standard kettuvallam can hold up to 30 tons from Kuttanad to the Kochi port. A portion of the kettuvallam was covered with bamboo and coir to serve as a restroom and kitchen for the crew. Meals would be cooked onboard and supplemented with freshly cooked fish from the backwaters. Now these are a familiar sight on the backwaters and in Alappuzha alone, there are as many as 500 houseboats. While converting kettuvallams into houseboats, care is taken to use only natural products. Bamboo mats, sticks and wood of the areca nut tree are used for roofing, coir mats and wooden planks for the flooring and wood of coconut trees and coir for beds. For lighting though, solar panels are used. Today, the houseboats have all the creature comforts of a good hotel including furnished bedrooms, modern toilets, cozy living rooms, a kitchen and even a balcony for angling. Parts of the curved roof of wood or plaited palm open out to provide shade and allow uninterrupted views. While most boats are poled by local oarsmen, some are powered by a 40 HP engine. Boat-trains – formed by joining two or more houseboats together are also used by large groups of sightseers. What is truly magical about a houseboat ride is the breathtaking view of the untouched and otherwise inaccessible rural Kerala that it offers, while you float! Now, wouldn’t that be something?